Exciting times lie ahead, thanks to Digital Transformation. Beyond e-Commerce, where the impact is explicit, financial services will see paradigm changes. A Boston Consulting Group study extrapolates that about 150 million people would have some digital experience in financial transactions by 2020. It also says that about 70 percentage of the urban population would be digitally influenced to use at least one financial product. Due to the immense cascading effects of the financial services industry, all other industries will be impacted indirectly and directly too, by the digital transformation wave. At the same time, the financial services sector is evolving too. The extent of tech involvement of BFSI companies has culminated in a new genre of fintech companies, which think and operate like technology companies although their purpose is to cater to the financial service needs of customers. 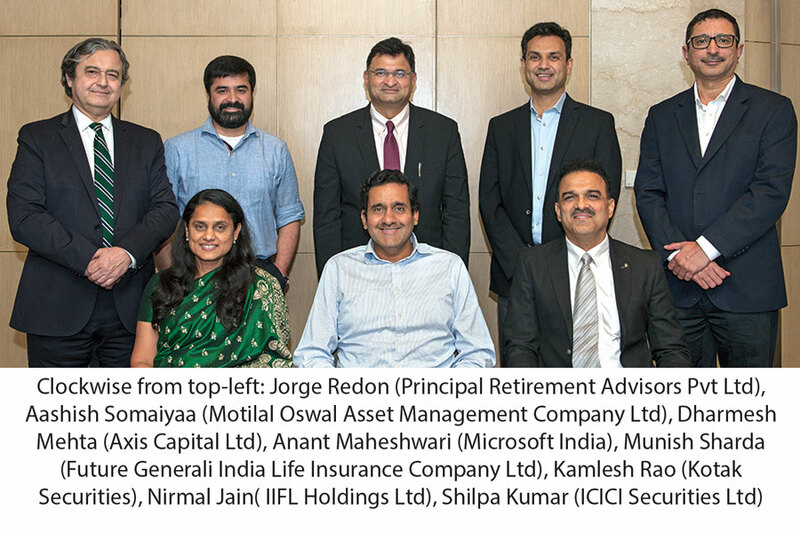 The Forbes India Leaders Speak Digital Transformation series, powered by Microsoft, sought to understand how companies and institutions in the financial sector adopt and adapt to new technologies available at various levels of their business. It also investigated the gaps and what India – both private players and the government – should do take things forward. In a thought provoking discussion between banking and financial sector stalwarts - Dharmesh Anil Mehta, MD and CEO, Axis Capital Ltd; Kamlesh Rao, MD, Kotak Securities; Munish Sharda, MD & CEO, Future Generali India Life Insurance; Nirmal Jain, Chairman, IIFL Holdings Ltd.; Aashish Somaiyaa, MD & CEO, Motilal Oswal AMC; Jorge Redon, MD, Principal Financial Group; Shilpa Kumar, MD and CEO ICICI Securities Ltd and Anant Maheshwari, President, Microsoft India - interesting insights emerged. Dharmesh Anil Mehta observed that there have always been security issues; but with mounting concerns about it and people moving their data offline to the cloud, security will keep getting stronger. Sharing the learnings gleaned from the online broking journey of ICICI Securities, Shilpa Kumar admitted that although their mobile platform is successful, the transition was challenging, especially due to the complex nature of the products on offer. “We invested a lot of time and energy into making it work,” she concluded. Aashish Somaiyaa concurred that digital is a great enabler, “Today, we are able to create an asset management company where we have just 20 people in investment and 20 to 30 people in other areas. In fact, we don’t have offices in Jamnagar or Junagadh or Tinsukia in Assam.” He also marveled at the way the digital initiative of Aadhar has brought everything on a common platform, making performance a priority, rather than ‘reach’ and ‘legacy’. Jorge Redon explained that for solutions to be truly digital, clients must be given a meaningful value proposition through a meaningful IT platform. At the same time, one has to use meaningful tools within the digital ecosystem to divert the traffic to one’s operation. To stay current in terms of systems, products and everything, Nirmal Jain suggested that companies need to be ‘agile sprinting’. They cannot wait to develop a perfect product. Everything, including R&D, has to follow faster turnaround cycles. Shilpa Kumar opined, “So much is changing, including basic products. So in addition to offering the best of service and access, you have to make sure it’s all at instantaneous speeds. That becomes very critical.” She went on to say that customers push for digital transformation as rapidly as possible and they will not tolerate any glitches. Ironically, while they seek change, they are also loyal to older systems and processes. While she was confident that change will ensue the rate at which it happens is relevant. “The other thing is the scale at which the change happens; right now technology is actually changing ecosystems and therefore, who you thought was your competition may not be your competition. So you have to be alert about both the speed of change and the scale of change,” she advised. Can China become a global leader?